Ukraine’s Supreme Administrative Court: captured GRU officers not "prisoners of war"
The lawyers sought to prove that the norms of the Geneva Convention should be applied to their clients. The claim was filed against President of Ukraine Petro Poroshenko, who acts in the name of Ukraine, while the third parties were determined the Prosecutor General's Office and the Security Service. 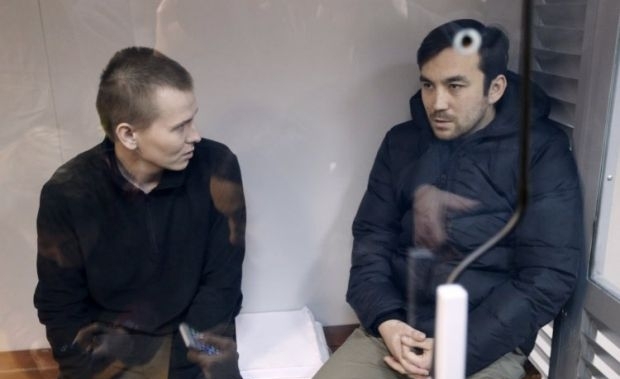 The Ukrainian office of the Red Cross was also stated as third party, which also believes that Aleksandrov and Yerofeyev are prisoners of war, and should be tried according to the provisions of Geneva Convention, rather than be subjects of criminal prosecution," said the lawyer, Oksana Sokolovskaya. Read alsoCaptured "Russian soldiers" deny serving in military during court hearingAs UNIAN reported earlier, Alexander Alexandrov and Yevgeny Yerofeyev were detained on May 16 in Luhansk region, near the city of Shchastya, during the battle in which a Ukrainian soldier was killed. During interrogations, they claimed that they served in the Russian army, and performed a service task in Ukraine. Russian Ministry of Defense claimed that the two detainees had been dismissed from the army in December last year. Read alsoFellow villagers of captured Russian sergeant: "If they got him, then the Russian troops really are in Ukraine"Later during the trial, both Russians described themselves as unemployed and stated that the Ukrainian security officials pressured and tortured them during interrogations.